IObit Advanced SystemCare4 is your one-stop shop for all your computer management needs and is, quite honestly, the most full featured and complete PC cleaner application I have ever seen. 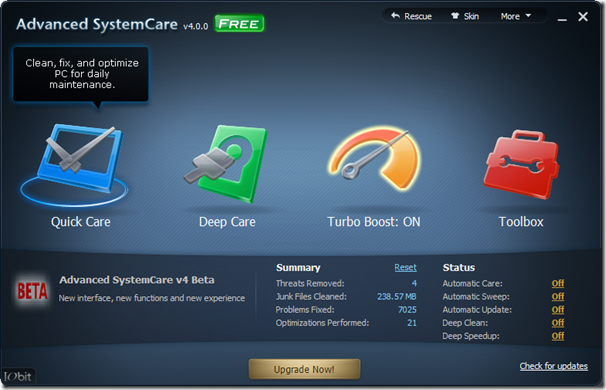 Along with the standard suite of malware, registry and disk drive cleaners SystemCare4 also includes privacy protection, several speed boosting modes, closing of application vulnerabilities (which in my case recommended a couple of Microsoft updates that were not dished out by Windows Update) and several other useful features. It even has disk defragmentation which moves into disk optimization in the “Pro” version. As you may know, I have a ‘weak spot’ for useful users. This week’s MVU (Most Valuable User) is Peter Mortensen, editor-in-chief. VirtualBox and Networking – How you do it. and others of a similar ilk. Well, let’s delve into the mysteries of VirtualBox’s networking (and networking in general) to unravel the secrets behind setting it all up right. If my operating system is 64 bit can my 32 bit applications use 64 bit memory (> 3.5GB)? And the answer is, in truth, yes. Yes, you can. But it’ll cost you and, probably, make your life difficult. It’ll also make people wonder why you wanted to try it in the first place too, what with all these new-fangled 64-bit processors and operating systems flying about using whatever memory they need to do whatever they like. There are many technologies for achieving this, these include PAE, PSE, PSE-36, AWE (Windows), mmap (Unix/Linux) and they all have one thing in common: they require special support to use properly. In some cases forcing the issue means things can and will break, horribly. TL;DR Version: All these technologies are there for developers. They provide no immediate solution for end users. File permissions in UNIX are frequently specified as an octal number. Why is octal the preferred base for this purpose? I own a particular file on a Linux system. I would like to give 2 groups (accounting, shipping) read access and only read access, and 3 users(Mike, Raj and Wally) write access and only write access. How can I accomplish this? In a world of Windows where file permissions can be granted on a per-user basis, Linux and Unix permissions seem to be very hokey and restricted. Well, let me tell you, they’re not. For such a seemingly basic arrangement they are an incredibly powerful tool. Most people forget that to do anything even remotely fancy with permissions in Linux you really have to couple them with groups. And you really can do some fancy things with them! In this edition of the Battle of the Giants, we look at both Google’s and Microsoft’s online document editing programs. Microsoft has been in the market of document editing software from the inception of Windows 1.0 with Windows Write. Now Office 2010 has been selling for some time now, and while you might prefer other solutions like OpenOffice or the newer LibreOffice, Microsoft Office has a major foot hold in the Word Processing market. With the release of Live services in 2005, Microsoft started to offer for free, online versions of their Word, Excel, and PowerPoint programs. Microsoft’s online services have now gone through 4 major updates/releases and currently offers Word, PowerPoint, Excel, and OneNotebook. Google moved into the online documents world with the acquisition of Writely, a Word alternative, in 2006. Later support for spreadsheets, and presentations were added. Currently Google offers Document, Spreadsheet, Presentation, Form, and Drawings. 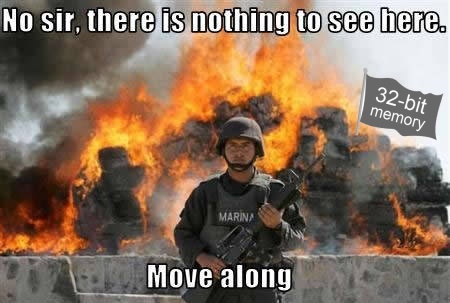 To flag or not to flag? That’s a question you might want to ask yhw42. Meet yhw42, unknown to most, yet loved by every mod. Why?